Make your company annual report stand out with this creative InDesign template. It comes with fully customizable 40 page designs in A4 size, which you can easily edit to change colors and layout to your preference using InDesign CS4 or higher. If you’re looking for an annual report template with lots of images and visuals to highlight give a creative look to your brochure, this InDesign template will come in handy. It features 20 unique page designs with images, text, and backgrounds organized in separate layers, making it easier for you to edit the designs however you like. This elegant and minimal annual report template is perfect for making a brochure for a creative agency or a corporate business. The template includes 24 page designs with editable colors and layouts. This modern annual report template comes in both A4 and US Letter sizes featuring 24 unique pages for crafting a complete annual report for your agency or business. The template is compatible with InDesign CS4 and higher. With 16 unique page designs to choose from, this template is suitable for making all kinds of annual report brochures using either Microsoft Word or Adobe InDesign. The colors, text, and the images in the brochure template are easily editable as well. If you’re making a business plan or a projection report in the style of an annual report, this template will help you create a professional brochure showcasing your business or brand. The template includes 16 pages in MS Word and InDesign formats. 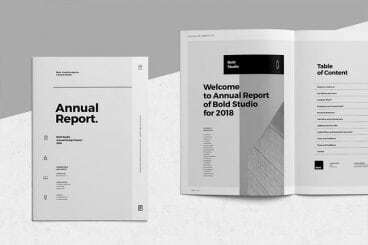 This is a highly minimalist annual report template featuring a black and white color design. Although, if you’re not a fan of B&W colors, you can easily change the colors to your preference as well. The template features 36 page layouts in A4 and US Letter size. This modern annual report template is most suitable for making brochures for corporate agencies and companies. It includes 16 unique pages in A4 size and it’s compatible with InDesign CS4 and higher. Another creative annual report template featuring a multipurpose design. This template comes in 2 different color schemes, which you can also easily customize to your preference. It includes a total of 48 page layouts as well. This simple and clean InDesign template will help you create a modern annual report to showcase your business and progress in a professional way. The template comes with 40 pages and it’s available in A4 and US Letter size.